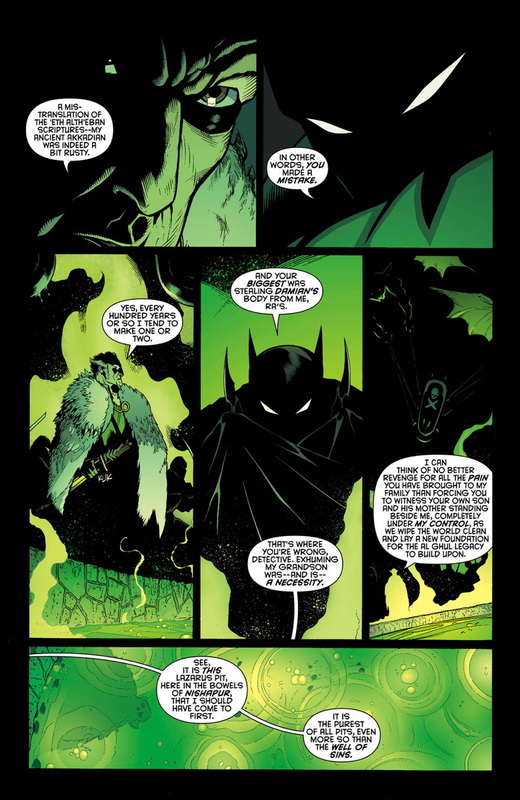 Instead of finding out if Damian is going to come back from the dead after clearly seeing him almost dunked in the Lazarus Pit, we get a bunch of boring dialogue between Ra’s and Batman as they both argue about the pros and cons of bringing someone back from the dead. 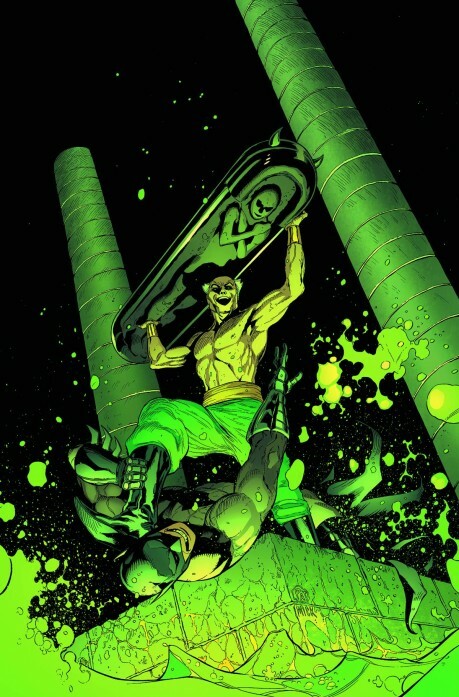 Ra’s says that THIS Lazarus Pit is more pure than all of the other Lazarus Pits around the world, and that this one will bring Damian and Talia back from the dead with no problems whatsoever. 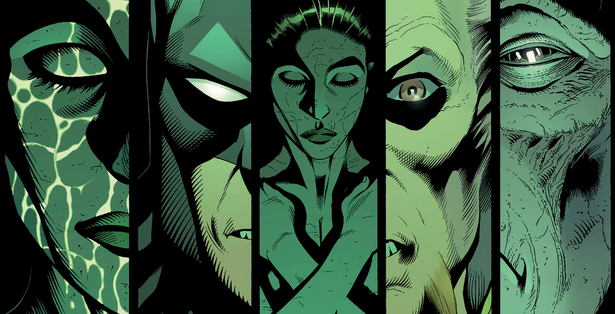 When has there ever been more than one Lazarus Pit and why hasn’t Ra’s used this one before if it’s “the purest” compared to all of the others. 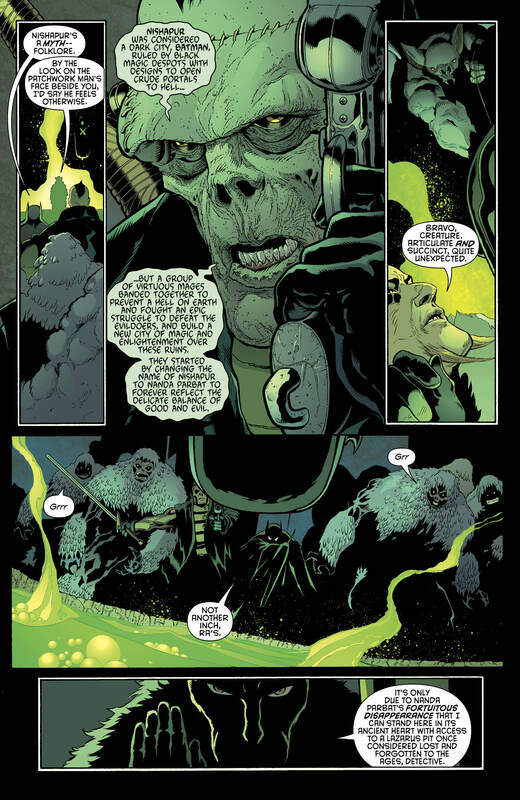 Let’s just say that I believe that Ra’s runs multiple Lazarus Pits like Turkish bathhouses and has a checklist with him at all times. Why does Ra’s want to bring Talia back all of a sudden? Talia put him in a prison while she made multiple clones with Man-Bat DNA (Thank you Grant Morrison) so why would he want to bring her back from the dead only to have her against him again? This issue doesn’t make much sense, Frankenstein feels like an object in the background instead of being one of the more focused characters. Batman punches his way to get Damian back while threatening to kill Ra’s if he tries to kidnap Damian again (Thanks for ruining Batman’s code of ethics in one issue). Of course, the issue ends on a lackluster cliffhanger that doesn’t mean anything until Robin Rises Omega hits stores later this year. All this issue does is act as a prelude to the next arc, Robin Rises. The art is great as always, but the story feels a little on the weak side as it’s possible that Tomasi and company are saving their best work for later. Compared to the great job that Tomasi has been doing on the Batman and Robin book since his start, this is easily one of the weakest issues of his run; I just hope that it doesn’t continue. +The art is always consistent. +I like the featured characters in each issue. -Dude, Batman can totally kill if he needs to, right? -Way too much dialogue with nothing going on.